Tears are produced continuously and are drawn into a small hole in the inner corner of each upper and lower eyelid known as the punctum. They lead into small tubes known as the canaliculi, which in turn drain into the lacrimal (tear) sac. This lies under the skin between the corner of your eye and your nose and leads into the nasolacrimal duct which drains into the lower part of the nasal cavity. Why does blocked tear duct (lacrimal obstruction) occur? If the nasolacrimal duct is blocked the eye becomes watery, and sometimes sticky. Some people develop a painless swelling of the lacrimal sac at the inner corner of the eye and in a few people this swelling becomes infected, causing a red, tender lump or abscess. How do I know if I have a need an operation? In the eye clinic you will see an eye doctor who will examine you and perform some tests which might include syringing water through the tear ducts to see whether there is a blockage. Sometimes two types of scan of the tear drainage pathway (a dacryocystogram and dacryoscintillogram) are needed to help assess your watery eye and plan your treatment. What is the treatment for lacrimal obstruction? Most cases of confirmed obstruction will require an operation to relieve symptoms once they occur. The primary aim of treatment is to either unblock the system, or to bypass the obstruction. DCR surgery creates a new pathway between the tear sac and the inside of the nose by removing a small piece of bone between them and joining the lacrimal sac directly to the nasal cavity, therefore bypassing the blocked or narrow nasolacrimal duct. In some patients, with particular types of blockage, small silicon flexible rods or “tubes” are placed to keep the newly made passages open while healing takes place. You can not usually feel or see these tubes after surgery. The rods will usually be removed at your outpatient appointment 6 weeks after surgery. The external approach, which is through a 1-1.5cm skin incision on the side of your nose, where a pair of glasses would rest. This heals up very quickly and in most people is nearly invisible when healing is complete. There will be a few small skin stitches, which will usually be removed seven to ten days after the operation. The second method is the endonasal (up the nose) approach. The procedure is done from inside the nose, using an endoscope and therefore avoids a skin incision. The inside of the nose is divided in the middle by the nasal septum which is formed of cartilage and bone. In some people the septum is either deviated to one side or has a protrusion on one or both sides. This can reduce the space in the nasal cavity where the operation would be done and removal of the protruding part of the septum (septoplasty) may be required to make the DCR possible. This is a common operation and adds about 30-45 minutes to the DCR procedure. The external appearance of the nose should remain unaffected by this. Bleeding: a small amount of additional bleeding is common. Very occasionally this may be severe requiring admission to hospital and packing of the nose. Infection: if this occurs you may be aware of increasing pain, fever and a red and tender nose. This will probably require surgical drainage and antibiotics. Numbness around the nasal tip and front teeth can occur. It is usually temporary but very occasionally persists. Nasal adhesions (a band of healing tissue between the septum and the tissue on the outer walls of the nasal cavity). This rarely causes any problem but can be checked and treated at your follow up appointment if necessary. Change in external nasal appearance. This is very rare (approximately 1:500) and is even rarer for the small septoplasties that may be required to assist DCR surgery. If it does occur, corrective surgery may be required. 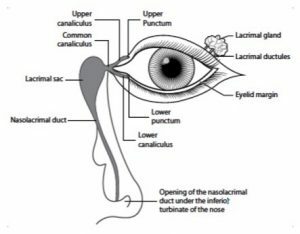 Nasal septum perforation: this occurs in approximately 2% and does not usually cause any symptoms but can cause persistent bleeding, nasal crusting or a whistling noise when breathing through the nose. Distortion or reduction in sense of smell. This is rare and usually recovers. Cerebrosinus fluid (brain fluid) leak. This is extremely rare, but can be serious and usually requires surgical repair. If you have a septoplasty performed you will be given additional care instructions from your surgeon. DCR surgery is 90-95% successful at improving the watery/sticky eyes, when there is a clear blockage. DCR surgery is 75-85% successful at improving the watery/sticky eyes, when there is functional delay, i.e. there is slow passage of the tears, but no obstruction has been demonstrated on the scans or syringing. There is no difference in success rates between external and endonasal DCR. Blood thinning medications such as aspirin, clopidrogel (Plavix, Iscover) and warfarin can make bleeding more likely during and after surgery. If you are taking these drugs your doctor will tell you if and when to stop these medications prior to surgery. It is helpful to discuss stopping the blood thinners with your general practitioner or cardiologist. You should also stop anti-inflammatory drugs like ibuprofen (Neurofen), fish oil, ginger, ginseng and garlic containing supplements 2 weeks before surgery. If you smoke it is strongly recommended that you stop smoking for at least 3 days prior and 1 week after surgery. This is important as smoking impairs wound healing and increases the risk of infection. Avoid alcohol for a day before and a day after surgery. You must not eat or drink anything for six hours before the operation, except for medications which should be taken at least 2 hours before the surgery and with only a small quantity of water. On the day of surgery please dress casually and wear a top which buttons at the front. Please wash your face on the morning of surgery and men should shave. Do not wear any makeup, jewellery or contact lenses. The operation takes about an hour and is usually performed under a general anaesthetic, but external DCR is sometimes performed under local anaesthetic with intravenous sedation. The procedure is usually ‘daycase’ (you are discharged the same day), but sometimes you will be admitted overnight. After you have fully woken from the anaesthetic and had something to eat and drink, you or the hospital will need to arrange for someone to drive you home and you should not go home by public transport. If you go home on the same day as surgery you will need to have someone at home with you on the first night after surgery. After your operation, have a quiet evening and avoid strenuous exercise for a week. You are advised not to drive, operate machinery, drink alcohol or take sedative drugs for 24 hours. You can wash normally. We recommend that you do not swim for at least two weeks. The eye and suture line is bathed with saline or cooled boiled water once or twice daily. Antibiotic eyedrops or creams and oral antibiotics are sometimes prescribed. You will be given a saline nasal spary which you should spray up the nostril on the side of the surgery twice a day for 2 weeks. This helps to wash away any old blood and discharge from the nose. You may wipe your nose or sniff to clear it, but you must not blow your nose for two weeks. If you sneeze, try to keep your mouth open. Hot food and drink should be avoided for up to 24 hours after the operation as they can cause post operative bleeding. For the next week ensure that hot drinks are left to cool a bit before drinking them. If sutures have been used, make-up should be avoided in the area of the sutures until after suture removal. Avoid heavy physical activity (ie bending and lifting, digging, strenuous exercise) for the first week. Walking, reading, watching TV and light domestic duties can be performed when you feel able. Do not use aspirin or blood-thinning medications for the first 5 days after surgery unless you have discussed this with the doctor prior to surgery. It is usual to have a watery eye for some weeks after surgery until the swelling and inflammation settles and if ‘rods/tubes’ have been inserted, sometimes the watering continues until these are removed approximately 6-8 weeks after the operation. If skin stitches have been used, you will be given a clinic appointment for one to two weeks after surgery for these to be removed. If you live far from the hospital, your doctor may organize for removal by your GP if possible. If endonasal DCR has been done, your doctor will arrange follow-up with you between 1 and 6 weeks after the operation. What are the main complications following lacrimal drainage surgery? After the operation you might experience some blood stained ooze from the nose. This usually stops after a few hours. If there is bleeding apply an ice pack to the bridge of your nose (on the opposite side to the dressing). Wipe away any bleeding with a paper tissue/kitchen towel. Occaionlly (about 1 in 100 cases) severe or continuous nasal bleeding will occur. If this happens, seek medical advice immediately or call an ambulance to take you to hospital. Infection is a rare but a possible complication. Skin infection can occur at the incision site in external DCR. Occasionally (less than 1 in 100 cases) sinus infection can occur which may need further antibiotic or surgical treatment. There are a few reports in the medical literature of CSF leak from DCR surgery. In theory this could result in meningitis. This is extremely rare, probably occurrining in less than 1:10,000 cases. You may experience mild to moderate pain in the first few days after surgery. Paracetamol or codeine (not aspirin or ibuprofen for two weeks as this could cause bleeding) should be adequate to control the pain. In order to avoid drugs containing aspirin, please read the contents of the packaging of whatever painkiller you wish to use. 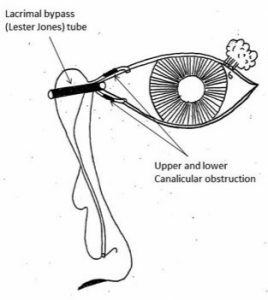 In some cases the canaliculi (see diagram below) are scarred, absent or non-functional, meaning that standard lacrimal drainage surgery will not work. In this situation a permanent bypass tube is inserted to allow tears to drain through to the nose, bypassing the abnormal canaliculi. These tubes are called Lester Jones tubes after their inventor and are made of medical grade Pyrex. The surgeon may place the tube at the time of your DCR or at a subsequent procedure depending on your specific problem. They are placed through a narrow tract which contracts around the tube while it heals. A suture is placed around the tube for 3-4 weeks to secure it while the tract is healing. Your surgeon will explain how to look after the tube and will arrange a regular schedule of review to check and clean the tube as necessary. Some patients have watery eyes caused by a delay in the passage of tears, without evidence of a blockage of the tear drainage system. This is sometimes called ‘functional obstruction’ or ‘functional delay’. In this situtation we sometimes try to place silicon stents (or flexible rods) throught the length of the nasolacrimal system from the punctum to the opening of the nasolacrimal duct in the nose. This tube is left in place for several months and then removed in the clinic. This procedure is successful for about 50% of patients, which is lower than for DCR, but it is a minimally invasive procedure. If it is unsuccessful, you can then proceed to DCR surgery.